Traditional Chinese culture dating back to the Ming Dynasty (1368 -1644) considered shark fin one of the eight treasured foods from the sea and since then have been traditionally served at dinner parties to express the host’s respect for his guests, particularly for Chinese weddings. Traditional Chinese Medicine (TCM ) crap clams that shark fin helps rejuvenation, appetite enhancement, nourishing to blood, beneficial to vital energy, kidneys, lungs and bones. But vitamin tablets supplementing a poor diet would achieve the same outcome, so the use of shark fin is purely cultural, backward and sick. Kam Fook Shark Fin Restaurant in Sydney located at Location: L6, Shop 600, Westfield Shopping Town Chatswood, North Shore is pure Chinese TCM backward culture and must be banned forthwith! 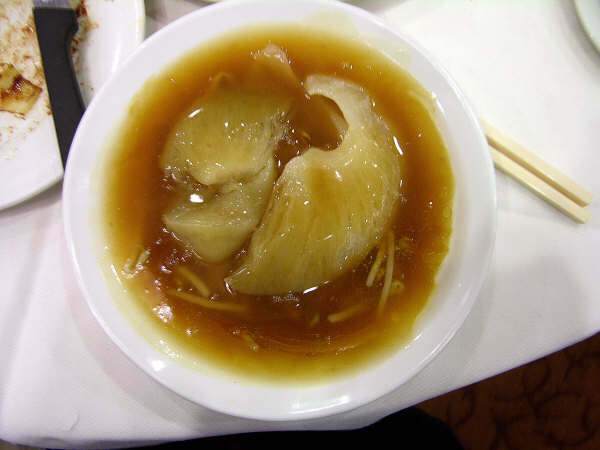 It serves Shark Fin soup, meaning that it endorses and encourages the slaughter of sharks for their fins. Many sharks are amputated and thrown back alive into the sea to die of an excruciatingly slow death. The practice is barbaric! It promotes the restaurant as famous "for menu items include dishes like shark fin with coriander or deep fried salt and pepper tofu." In May 2010, the United States introduced a ban on Shark Fin products in Hawaii after becoming the first state in the nation to ban the possession of shark fins. The state is attempting to help prevent the overfishing and extinction of sharks around the world. Governor Linda Lingle signed a bill prohibiting the possession, sale or distribution of shark fins. The bill passed the state House and Senate with broad support earlier this year. The legislation generated some grumbling in Hawaii's sizable Chinese community - more than 13 per cent of the state population is Chinese or part Chinese. Many consider shark fin a delicacy and important part of affluent Chinese culture. Australia's condoning of backward cultures like TCM makes Australia backward. Chinese getting married in Australia who celebrate with shark fin soup should be extradited on the moral basis of animal cruelty and abuse, or else fed to the sharks. Human detritus. That is what people who don't care about the environment are. Any cultural activity that allows or encourages such waste is toxic. Not only is the finning of sharks barbaric, but their indiscriminate slaughter at an unsustainable rate is pushing many species to the brink of extinction. Since the 1970s the populations of several species have been decimated by over 95%. Due to the clandestine nature of finning, records are rarely kept of the numbers of sharks and species caught. 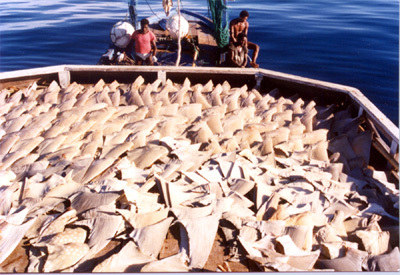 Estimates are based on declared imports to shark fin markets such as Hong Kong and China. 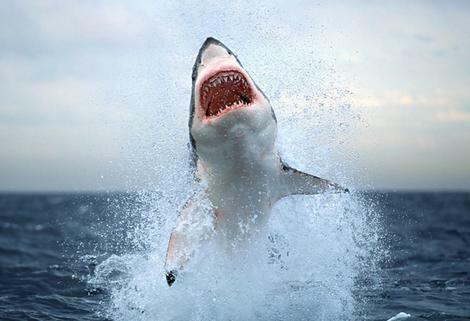 The shark is most often still alive when it is tossed back into the water. Unable to swim, the shark slowly sinks toward the bottom where it is eaten alive by other fish. A number of countries have introduced legislation to prevent shark-finning. Some stipulate that fins must constitute 5 per cent of the total weight of shark carcasses onboard. Australia is one of the few countries that require captured sharks must arrive in port intact, with fins still attached. The Secretariat of the Pacific Community (SPC) has detailed the findings of a grim report released last week on the future of Pacific Island fisheries. It says the industry is seriously threatened by over-fishing, population growth and climate change. According to the SPC, the end result is the industry could be dead by 2035. The report warned some types of tuna were already being dangerously overexploited and the problem would spread to other species as foreign fleets clamoured for access to rich fishing grounds amid a global fall in fish stocks. "There is a dangerous misconception that these resources will always be there but this is not true," the report said. "Pacific island fisheries are the major renewable resource available to the region for food security, livelihoods and economic growth," it said. Nothing should be "growing" - except renewable energy sources - while the natural world continues to shrink! The oceans or their biodiversity have no obligation to continue to produce food or economic benefits for a human population that insists on expanding. The word "inhumane" is somewhat of a contradiction since it refers to cruel conduct that is in fact characteristic of humans. Shark finning is one of those behaviors. It comes into the category of "we did it because we could". Presumably there are commercial reasons for this cruel and wasteful practice. Why else would a pragmatic fisherman throw good meat already caught back into the ocean? The fact that the animal cannot survive the mutilation and dies an excruciating death is a necessary consequence of this practice.